There are few more alarming plumbing issues than when your main sewer line backs up. What you may notice first is your bathtub suddenly has dirty, brown water in it. You may notice your toilets won’t flush. In some cases, if you have a clean-out in your front yard, you may notice toilet paper and waste overflowing from it, onto your yard. Super gross!! Nobody wants to deal with a sewer line repair. However, it is really important to understand if the sewer line is damaged, or if it is just a clogged sewer line. 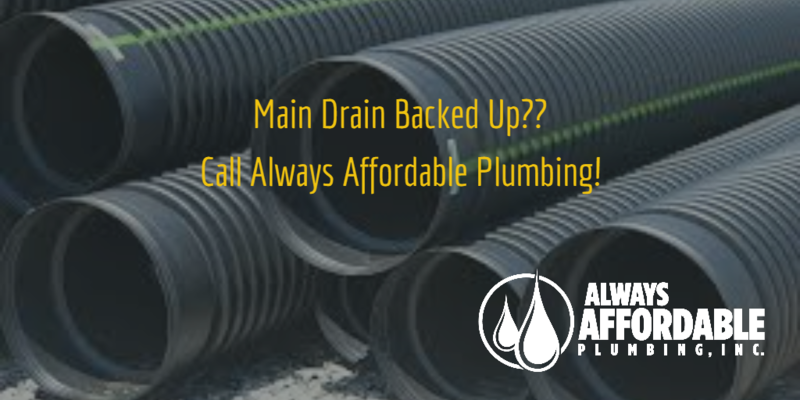 Always Affordable Plumbing are experts in diagnosing, and repairing any emergency sewer line repair you might have. We are also experts at sharing information on how to prevent major emergency plumbing issues. A sewer line backed up can be a major headache. Read below to learn about the most common things that will cause sewer line failure. The trick here is finding out where in the main sewer line it is clogged. Our expert plumbers will use their experience, training, and tools to determine the location, and then provide you with your solutions. Sometimes this requires the use of special video cameras. The common repair for this is to “snake” the line, or use a roto-tool to clear the blockage. Occasionally, the sewer line is plugged because of something else. This is where it can get a little more complicated. A very common occurrence, especially during times of drought, is root infiltration. This happens when nearby tree roots get into your sewer line in search of water. This takes a long time to occur, as tiny roots slowly force their way into tiny seams in your pipes. More and more roots start to grow in, and eventually, the roots themselves cause a blockage. Worst yet, the roots may grow so large that they actually damage your sewer line! An Always Affordable Plumbing plumber will inspect your sewer line to determine if roots are causing the blockage. They can then clear the blockage using a special roto-tool to grind away the roots, and then can inspect the pipe for damage. One thing you definitely don’t want is a sewer line that is damaged enough to leak or possibly burst! Talk about a major plumbing emergency! Those are the two main causes of sewer line blocks and sewer line failure. Other things can happen though. Sometimes the pipes are just old and deteriorated, and eventually collapse. In rare cases, ground shifting can damage your pipes. Sometimes the blockage is not even in your sewer line, but is street side and needs to be cleaned out by the county water district. No matter what it ends up being, Always Affordable Plumbing is here for you, 24/7. Providing honest, affordable, and clear estimates and recommendations for you. Call Always Affordable Plumbing today for a FREE home plumbing inspection. Don’t wait until your sewer line has a major issue. And remember, the easiest way to prevent a clogged sewer line is to be mindful about what you flush. In a worst case scenario, don’t hesitate to CALL ALWAYS AFFORDABLE PLUMBING, 24 hours per day, when your plumbing emergency can’t wait!! Whether you need a FREE Home Plumbing Inspection, emergency 24-hour plumbing services, leak detection, or have an issue with slow drains, Always Affordable Plumbing is here for you. Service, quality, and affordability for our customers always comes first. Call today to schedule your appointment! For our great plumbing tips and updates, FOLLOW US ON FACEBOOK! CLICK HERE to learn about the most common plumbing emergencies! !